On March 12, 2011, an earthquake with a seismic intensity of 6 and hit the Nagano-Niigata prefecture boundary hit Sakae Village in the early hours. The house tilted in the darkness, the road was shredded, 80% of the village people were forced to evacuate. We received much support from the whole country, restoration almost finished. We will keep records of this unprecedented disaster in order to communicate to future generations and display records of restoration and reconstruction so that we can keep disaster prevention consciousness all the time. 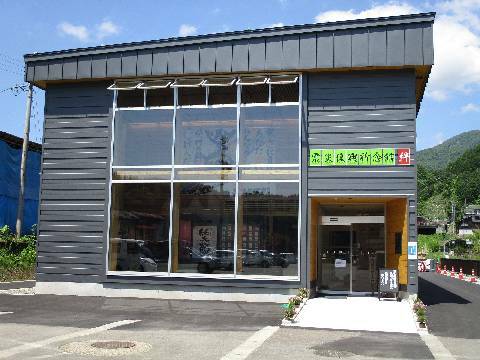 It is also an office of "Sakaemura Akiyamago Tourism Association", and it is a complex that also carries information on tourist information and tourist information at the Naeba mountain foot geopark and village residences. 70 minutes by bus from Echigo-Yuzawa Station(YS02), and get off at Morimiyanohara Station(YS41). About 2 minutes by walk from Morimiyanohara Station. From Tokyo Take route 353 → 117 after exiting the Shiozawa/Ishiuhci IC and it takes 50 minutes. From Niigata Take route 117 after exiting Echigo-Kawaguchi IC and it takes 70 minutes.